Its warning comes amid estimates that present coffee bean production must be raised by nearly 15 percent in the next 5 years, if we are to satisfy the expected demand of 165 million bags in 2020. Coffee consumption is highest in Brazil, USA and Europe; rising consumer income and increasing standards of living, especially of the growing middle class in Asia, have given coffee consumption a boost. Without question, Brazil, Guatemala, Tanzania and Vietnam are already suffering from climate change and are expected to experience more or less severe changes in the suitability of their coffee cultivation areas. In Uganda, climate change mapping shows that areas suitable for growing Arabica coffee will reduce drastically in the future. In Central America global warming provides favourable conditions for pests and diseases that leave harvests crumbled. These case studies illustrate that building up resilience to increasing climate variability is the most significant challenge facing coffee farmers. “The industry has to take more responsibility to invest collectively in the climate adaptation process, and ensure effective and long-term support for coffee farmers in all producing countries”, says Sjoerd Panhuysen, lead author of the Barometer. Labels such as Fairtrade, Rainforest Alliance, Organic and UTZ, aim to overcome many of the unsustainable aspects of coffee production. However, there is a growing gap between the volumes of certified and verified coffee available (40 percent of global production) at producer level, and the volume actually procured as certified coffee by the buyer. Only a quarter of FT, RA and UTZ is sold as such. In the short term smallholder farmers bear the brunt of the additional costs involved in making production more sustainable. The supply base of certified coffee remains highly concentrated, with over two thirds coming from Latin American producers. Africa is inadequately represented as a supplier to sustainable markets. 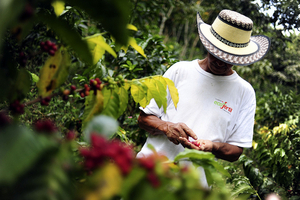 Certification is a tool towards sustainable production, but it’s not the magic formula. In particular in Africa more large-scale investments are required in coffee producing communities to address the social issues and support the adaptation to climate change. These include access to better farm management techniques, to markets, to finance, to insurance, to information and technology. “At this point, all in all, there is no credible alternative to cover the social and environmental costs of fair and sustainable production”, says Panhuysen. Although the consumer’s taste and price-quality considerations are the dominant factors, the sustainability aspect of coffee has become a factor in driving brand choice. In 2013, the sales of sustainable coffee have grown to 15 percent of total consumption. However, this remains less than half of the total amount of certified and verified coffee available. To realistically assess the commitments of the global top 10 coffee roasters, we should consider the size of their operations. Nestlé’s Nespresso AAA verified coffee label – an ‘entry level’ with minimum standards for sustainable production – represents 7% of its total procurement of green coffee. In the top five, DE Master Blenders is the best performer reaching 25% UTZ certified coffee in 2013. On a different note, Lavazza, Italy’s market leader, sells only slightly more than 1% of its total market share as certified coffee.